Let me take the liberty of allowing you to read one of the letters that Baba wrote to me (N. Kasturi) twenty-two years ago. It illustrates His omnipresence and His omniscience, as well as His boundless love - attributes that He has decided to demonstrate in this Avataric form in order to draw into the crucible of transformation the peoples of the world. I had returned to Bangalore after a long and arduous pilgrimage to the holy shrines on the Ganges, to Bodhgaya, Dakshineswar, Kamarpukur and Puri. I was urged to take my mother and wife on this pilgrimage by Baba Himself. He had blessed us the day we had set out, and assured us that we would have Him with us during our journey. He had said, "On three railway tickets, four shall travel." Baba, we knew, is the stowaway in every ark which breasts the deluge of delusion; He is the companion of all who progress on the road of pilgrimage. "Your letter reached Me at Kodaikanal in time, but since we came down to Madras that very day, I could not send you a reply. I reached Madras on the 25th, around midnight. (The letter is dated 26th.) I am happy that you have returned full of joy after visiting the holy places with your Mathru Devi (venerable mother). How can delay, disappointment or danger cross your path when Swami is ever with you? My name is not distinct from My form. The name recalls the form as soon as it is pronounced or heard. When the form is seen, the name comes into awareness that very moment. So, since the name is ever dancing on your tongue, the form, too, has to be before you and beside you. What need is there to mention this in your letter as a gift from Me? I have to manifest the form, whenever and wherever My name is remembered with faith or sung with devotion. "You might say that those visions were boons of grace from Swami. No, I always say, 'Sadhana first, Sankalpa later'. That is the correct order. My Sankalpa or Will confers bliss only after assessing the depth of yearning in the devotee. Sadhana is the essential prerequisite. You were a professor and so you can understand this easily. You must have evaluated the written answers of your students. You evaluate and assign them marks only after careful scrutiny of what they have written, don't you? I, too, measure and weigh the sincerity and steadiness of the Sadhana you have imposed upon yourself and I frame My Sankalpa accordingly. Of course, many are not aware that the misery in which they find themselves can be negated by Sadhana. 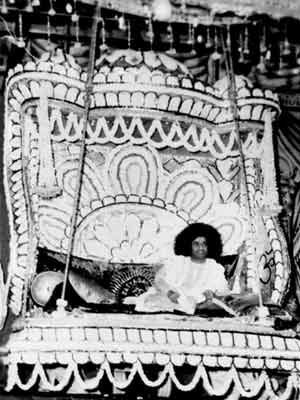 "At Kodaikanal, thousands had gathered for the evening Bhajans. They were having darsan for the first time in their lives. It was their 'right' to get darsan that had brought Me to this hill station. For, as you know, I had not planned to come here. It all happened so suddenly. 'Your daughter was very upset the other night over her husband's health. His illness had taken a turn for the worse. I was there when your daughter wrote Me a letter about his condition. She posted it next morning to the Puttaparthi address. It has not reached Me yet, but I knew its contents even while it was being written. When Swami's grace is available in plenty, why fear?" "Pattabhi, dear devotee. Swami is writing to you; see, He is blessing you. Dear child, but what madness is this? What a letter you have written and left at home! It is foolish to be hasty. Think over your affairs calmly. Slow deliberation always reveals the true and the beneficial. Think of the crores of people the world over who are in conditions far worse than yours. Remember always, you have Me to guard you and guide you. How many of them have this fortune? Consider that. Are you the only victim of poverty and indebtedness? The step you are contemplating cannot give you rest or peace. It is not right. It is not manly to run away from responsibility. Listen to Me! Go back to your place, be bold and face the world with courage, for courage will set you free. It will conquer all obstacles. Give up your foolish plan to escape." And Pattabhi went back, recovered self-confidence and made a success of himself. "There is no use My writing about the Samithis. I have been saying that the next world should be gained by man's triumph over the fascinations and fancies of this world; but the members of the Organisation have given up all thought of future lives and the other world. They behave as if this life, this world, is the only one. To them, this seems the only measure, the only goal. For such persons, illumination can be only as faint as the glow-worm in the night. Though the stars twinkle in the sky and appear as tiny specks when compared in brightness to the moon, they are really much more brilliant. Each of them is a hundred suns rolled into one. But for the limited vision of ignorant onlookers, the star is a spark and the moon a huge source of light. Such men think of the future, because of its 'distance', as quite trivial, and of the present, due to its immediate 'proximity', as very important. They pay no attention to the stars but continue to be overawed by the moon. Civilisation today is concerned with the atom, but it ignores the Atman." When He is away from Prasanthi Nilayam for long, Baba often writes letters to be read aloud to the residents. Usually, they are sharp reminders of the need to respect the rules and regulation He has laid down for them. "Blessings to all at the Mandir!" He writes. "Tell them all to fulfil their assigned duties and responsibilities. The daily schedule of puja, dhyana, bhajan, sankirtan and study should be followed punctually and with faithful devotion. People should move among one another with love and reverence. Of what benefit is sadhana if it is done without controlling jealousy, envy, pride, anger and malice? However long you may live in the ashram, these vices will undermine any merit you acquire. As the proof of the rain is in the dampness of the ground, so the proof of sadhana is in the subjugation of the senses. Give up all irrelevant and impertinent talk and activity. Cultivate self-examination and self-discovery and develop, through discipline, the inner eye. Make the best of this chance acquired as a result of your good actions in many previous lives. 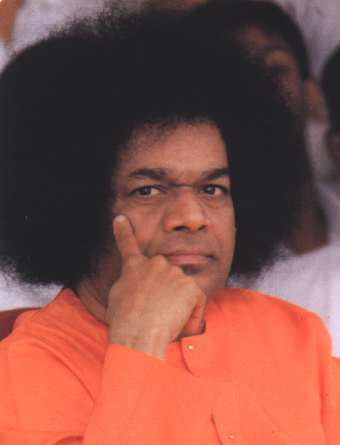 Of course, Swami's grace and love are always with you, but to earn them more and more, sadhana has to be done everyday, with greater and greater enthusiasm. The residents of Puttaparthi and Prasanthi Nilayam have to pave the way for mankind, so, they have to lead pious, humble and disciplined lives." Now for some letters Bhagavân has written to be read out to the students of Sri Sathya Sai colleges. Since they have had the opportunity of a closer association with Baba, and more chances of listening to intimate expositions from Him on the unity at the base of this illusory multiplicity, these letters reveal the crux of Baba's teachings regarding the individual and the universal, the Atman and the Paramatman. On Janmashtami (celebration of the birth of Lord Krishna) in 1974, He sent this letter to the college students at Brindavan. (It may be news to some, but it will not surprise His devotees to know that these letters are written by Baba Himself in English). This is only further evidence supporting Baba's declaration that He created the universe of Himself, with one word, to become all this diversity (ekoham, bahusyaam). "the bird with you, the wings with Me; the foot with you, the path with Me; the eye with you, the form with Me; the thing with you, the dream with Me; the world with you, the heaven with Me - so are we bound, so are we free, so we begin and so we end, I in you and you in Me." Viewed superficially, it may appear epigrammatic effusion, but below the surface lies the treasure of truth: "I am in the Father and the Father is in Me" (John 14:11). Essentially man is but a fraction, a fragment, a fiction in search of a fact. God, alone, adds value to the zero by standing as an integer by its side. Gustaf Stromberg from Mount Wilson writes, "The development of a living organism is in many ways like the building of a machine designed to perform a definite function in the future. A plan must first be made and this can only be made by an intelligent being, with his attention focussed not only on his past experience but also on the purpose for which the machine is constructed. Nature, apparently, has foresight and intelligence, and it is capable of highly organised activity. Since an impersonal nature cannot have such characteristics, we are led to the idea of a personal God." The letter of Baba mentioned above, is reminiscent of such a One. In the world of today, so full of people who are selfish, unloving and unloved, the brand of atheism known as 'self-love' has spread to the extent of almost becoming a universal religion. What is the Self? It is the Self that says 'not I', for if it says 'I', then it is the unreal self. The real Self is selfless, and has no thought either of or for itself. It is the Self that has now forgotten itself, because somehow, it can visualise itself only in others. It is the Self that loves selflessly, because pure love is but selfless affection. It is the Self that seeks the truth with selfless determination, because truth is selfless wisdom. It is the Self that is quiet, because in silence lies cessation from all worldliness. It is the Self in wordless meditation, because wordless meditation is the conquest of the mind through union with the Divine. It is the Self that does not judge, but evaluates. It does not compare, seek security, or even see itself. It is the Self that has completely absorbed itself and yet, in a strange and mystical fashion, it is more itself, more complete and more real than it has ever been. This is the real Self. God is love, and love is selflessness. Selflessness is the abolition of all sense of the ego and separativeness, of all spurious identification with the isolationist life of that counterfeit thing called 'self'; self is separativeness, and separativeness is the denial of wholeness, holiness, God. The denial of God is known as atheism. As can now be understood, atheism is not the denial of this or that religion or of this or that concept of God. It is rather the denial of a life of love, which is the nature of God, and the assertion of the life of the egoistic self. In short, real atheism is the denial of love and the assertion of selfishness. The Godward process called 'self-sacrifice' is, in its essence, love. For God is love, and love alone can lead to Him. As the most godly act is one of love, the most godless act is one of hate. But hate, which is separativeness, can arise only when there is selfishness. Thus it comes to pass, that the most godless, loveless, atheistic act, is the act of selfishness. Love must be totally selfless to be Godward, to be Divine. Its criterion must be, 'the Beloved, first'; its technique must be 'your happiness before mine'. The way to happiness is to forget oneself and to remember God, Sai Krishna. There is a mysterious episode concerning an Indian couple who live in America. The husband, Dr. Y.S. Thathachari, is a dedicated biophysicist who has worked for some years at the Massachusetts Institute of Technology and after that at Stanford University and the University of California. As early as 1960 he suffered, as the doctors suspected, from rheumatoid arthritis. But the experts who examined him at Stanford - after dozens of X-rays, brain scans with radioactive mercury, a surgical excision, chemical tests and a biopsy of the scalp lesions (he had developed several bumps on the scalp) - declared that he had "aggressively malignant and metastasising tumors in the skull, the neck, the ribs and the hips, the cancer having the features of both ewings and retiaulum cell sarcoma." It was a death sentence enveloped in medical abracadabra! In a letter to me on this judgement, Thathachari wrote, "Thus after delivering blow after blow, the surgeon told me, 'Sir, miracles do happen. We hope such a miracle would happen to you.' " That was in 1962. The couple returned home to Madras to be in the midst of relatives, while trying out palliative therapies. "In 1965, I felt like seeking the blessings of Bhagavân S'rî Sathya Sai Baba, following a chance reference by a friend. Baba blessed me and my wife and directed us to go back to Stanford, continuing the endoxan, if I wished to do so. In 1970, when I approached Him again, He asked me to discontinue all drugs and dietary supplements. He gave me an assurance of cure and dispelled that ever-present dread of recurrence." Thathachari is now pursuing his teaching assignment and research projects in America with undiminished zeal, thanks to the 'miracle' that happened. When asked how he brought about this most wondrous miracle that defied all medical predictions, Baba replied, "All I did was to invest him with confidence and willpower to cure himself. It is My abounding love reciprocated by the intensity of the devotee's own faith, that finally produced the desired result." "My dears! I know that though your bodies are far, far away, your thoughts are with Sai. That awareness and attachment is sufficient to keep Me near. Thoughts have no walls or boundaries; they can reach Me across the oceans. There is no one without Me; I am with and within every one. "When only the body is near but the thoughts are afar, the situation is like frogs leaping around a lotus flower. But bees know of the ambrosia that the lotus is ready to give; they yearn to partake of its sweetness and ever hasten towards it. Bangaroo! (a word meaning 'gold', which is applied to a child who is charming and well-behaved.) You have Swami's grace in plenty. Where the Name is, there is the Form. "Busy yourselves with the duties which are entrusted to you, in good spirit and fine health. Sai is ever by your side. He is the charioteer of the vehicle of your life. The ship of life, however heavily loaded with the cargo of joys and sorrows, can certainly arrive at the harbor of self-realisation, if it is propelled by holy mental energy. Repetition of the Name is the 'dug-dug-dug' of the pistons; the steering wheel is love; the anchor is faith. Continue the journey in confidence. Sai is always guarding you from harm and pain. You both are like His two eyes. Swami is constantly showering His compassion on you. He counsels you from within and corrects you. On your part, be immersed in the duties entrusted to you; remember, that is Swami's work. When you discharge your duties, convinced that the work is Mine, health and happiness will be added unto you." When a devotee, R. Lal, telegraphed from Bombay that he had a severe heart attack, Baba wrote to him, "It is not in any way connected with your heart. Do not exaggerate the small malfunction. Shiva-Shakthi is in your heart; that Shiva-Shakthi will not permit any infirmity or injury to affect it. Be happy. This day, Mother Sai is conferring on you the boon of Her love. That will grant you health, joy, peace, courage and contentment." "Mother, the news that your husband attained merger with the Divine came to you all of a sudden. It is quite natural that you were shocked at the accident which killed him, and feel miserably lonely and deserted. The daughters of Mother India do revere their husbands as their all, and are ever concerned about their health, honor and peace of mind. Yet one should not forget that the body is composite of diverse elements. It must disintegrate into those elements, however much one might guard it or lay claim over it. It is a feeble contraption, prone easily to be put out of action. A slip, a stumble, a hit, a sneeze, a little carelessness or a moment of recklessness, is enough to damage or destroy it. No one can avoid death, even if one manages to lengthen one's life by avoiding all these. Even avatars take birth resolving to die some day. When birth occurs, death has to follow. To grieve over death, which is an inevitable and inescapable consequence of birth, is not a sign of wisdom." "Two fundamental messages ringing through Indian culture down the centuries are: 'Revere the mother as Divine. Revere the father as Divine.' These are sacred commands. When the parents are by-passed and hurt by disobedience, I am sure I, too, will soon be by-passed and disobeyed. When your son treats you a non-existent, how can he claim to revere Me? That claim is patently false. "The Lord does not demand external grandeur; He examines only whether internal purity exists. A life lived badly is like a body without life. The body, in Sanskrit, is called Deha, meaning 'that which has to be consigned to flames'. A body belonging to a person who does not strive for inner purity can live only for that consummation, to justify that appellation. It serves no other purpose, and it cannot be blessed by the grace of the Lord." "The value of education has to be measured in terms of the virtue it implants, because virtue, alone, ensures peace and joy. Without it a man is as good as dead, or even worse. Education must endow man with a sharp, discriminative capacity. But for your son, it is an ugly and vulgar acquisition. (sathya, dharma, santhi and prema are the cardinal virtues.) Sathya is what I teach; Dharma is the way I live; Santhi is the mark of My personality; Prema is My very nature." 'Where there is a will there is a way' is absolutely true. At first the will is your own. It has to be strengthened by the assent of God; but until you convert it into the almighty will of God, you seem to be playing a particular game which you do not desire to give up. You can always change the game, if you so wish. You are not weak and helpless. All strength and power is within you. God-vision is yours the instant you will it with concentration. But you simply don't choose to do so. "Sai is not mocking, He is perfectly earnest. He is giving expression to the truths gathered from the depths of experience. 'trust in, and submission to the supreme will in all circumstances', means 'the vision of truth' or 'realisation of the eternal principle of all creation'. 'If God Wills' means, 'if you assert your own all-powerful will'. The real solution, therefore, is to awaken the inherent power and splendor of your soul. Do it, boys! You are verily the immortal truth, the great changeless reality. May victory ever be yours. With blessings, Baba." "Boys, through the awareness of the divine, alone, can we bring true peace to the world. There is no doubt that considerable effort is being made by great leaders of the world to bring about peace and harmony on the material plane. But Sai does not see any sign of their success. "The only way left for us is to turn our minds within ourselves and to find out that the true and everlasting basis, that supreme source from which, alone, we can bring true happiness and peace to the world. That basis is God, who is, in fact, dwelling in the hearts of every one of us. He is the universal spirit. "Every one of you is an embodiment of the divinity. You are Sath-Chith-Ananda, but have forgotten this truth. Realise it now. Meditate on the reality until your mind dissolves and you stand revealed as truth itself, and enjoy, as Sai has been enjoying, that eternal bliss. With blessings, Baba." Pundit Veerabhadra Sarma is a renowned Vedic scholar. He can expound the sacred scriptures and hold vast gatherings spellbound for hours by the clarity, simplicity and sincerity of his Telugu oratory. He is also a leading minstrel of the popular Burrakatha musical recitals, and has composed a Sanskrit 'Sai Geetha' and 'Puja Vidhana' on classical lines. He was chosen to be a member of the party that undertook the pilgrimage to Badrinath when Bhagavân decided to bless that holy Himalayan shrine. In spite of these unique distinctions, his material poverty was so acute that one day he blamed Baba for 'neglecting him and heaping upon him misery after misery.' His wife, who could not bear this sacrilege, offered to write to Baba about the situation. She was certain that His blessings would clear the sky. But Sarma was adamant. 'No prayer should proceed from either of us to Baba, who has mercilessly betrayed our trust," he insisted. This was on 20th January 1962, at Kakinada, eight hundred miles from Prasanthi Nilayam. Bhagavân, of course, sensed his pique and was aware of his obstinacy. So he wrote Sarma a letter Himself, which reached him on 23rd January 1962. Sarma revealed to me its contents. The letter is a miniature Gîtâ which reveals the love that Baba showers upon those who are misguided and move away from His fold, the courage He instils by revealing to the desperate their own inner treasure of strength and the course He lays down for their liberation from the entanglement of ignorance. "Dear child Veerabhadram! You are Bhadram (secure, happy, full of confidence and joy), aren't you? You might ask, 'What kind of Bhadram is this? Of course, that question is natural. When life flows clear and smooth with no hurdles to cross, to feel that it is so because of oneself and to forget God, and when that flow encounters obstacles and obstructions at every turn, to lament and lose heart - are these not signs of the intellectual frailty inherent in man? You, too, are human, dear Bhadram, therefore it is no wonder that you are overcome by depression and despair when troubles bother and obstruct you at every step. "Though the life of man is basically a manifestation of immortality and an unbroken stream of ananda, he strays away from the awareness of the atman, the spring of that ananda, slavishly yielding to the vagaries of the mind, the intellect and the ego. Sinking and floating, rising and falling on the turbid waves of the sea of delusion, he is tossed between anxiety and calm, grief and joy, pain and pleasure. He is afflicted with the evanescence of the world and the unreality of his desires. "Why are you confounded and confused by this false panorama? Remember, you are thereby despising and denying your own atmic identity. You have stored in your brain the Vedas, the Sastras, the Purânas, the Ithihasas and the Upanishads, but you behave like a dull boor. You bewail your lot and weep at your plight as if you had no resources to fall back upon. This attitude is not worthy of the learning you have accumulated. You have to draw strength and courage therefrom and further the blossoming of holy, heartening thoughts. "Should this one single trouble - want of money - make you stoop in weakness and fear? You have with you the name which is the Dhanavanthri (Divine Physician (see also: SB, 8:8)) for all the ills and anxieties of man. Instead of letting that Name dance joyously on your tongue, why are you paying so much attention to what you call loss, grief and worry?" "You are the repository of so many branches of scriptural scholarship, but you have neither realised their value nor attempted to experience the joy they can give you. This must be your prime goal. Instead, you are spending your days in the mere satisfaction of having acquired this knowledge, as if fluent oratory were the best purpose to which you could devote your learning. The result is that you are led into the baseless belief of being attacked by anxieties and adversities." "Really speaking, these are all objective phenomena, passing clouds that are but a feature of the external nature. The ananda that the atman can confer on you cannot be lessened or hindered in the least. Have firm faith in this truth. Don't you know, bangaroo, the freedom, the delight and the tranquillity you can derive by contemplation of the ananda that the unbroken awareness of the atman can endow you with? Knowing this, even if you are confronted by the seemingly most insurmountable problem, how can you get entangled with or be affected by circumstances and phenomena in the objective world?" "To preach to others is quite easy, but to put even a fraction of what is preached into actual practice and experience the felicity promised, is extremely difficult. You have been announcing in ringing tones that 'Swami knows everything; Swami is the unitive embodiment of all the names and forms by which man has adored God down the ages. But when problems overwhelm you, you forget to establish these truths in your own life." "Don't I know? 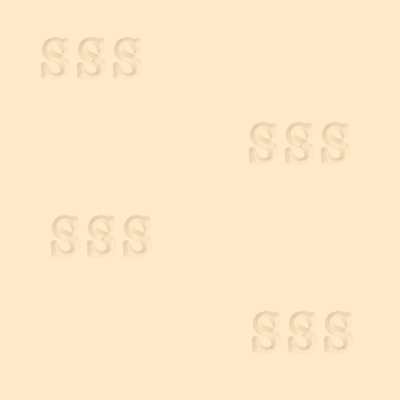 The other day, when you had been reduced to plead with your father for help and when you were about to proceed to where he resides, your wife suggested, 'we shall write to Swami about our troubles and losses', let Me ask why you told her, 'I won't allow this; you should not write'? I shall even tell you the reason. You thought she might inform Me about various other details. Don't I know? Can I know this only if she writes to Me? Foolish bangaroo!" "Don't I know that you went to Ramachandrapuram to give a series of talks on the Gîtâ and returned with a minus balance? The Gîtâ discourses did not receive the response you expected because your talk was pervaded and polluted by the Burrakatha style that has long struck root in you. It cannot be easily overcome. Bear with it patiently and, with steady effort, be rid of it. If you desire that your Gîtâ lectures be appreciated, some improvements are called for. Without effecting them, why do you moan, be gloomy and dejected, blaming your scholarship and your experience as mere useless loads. "Let Me tell you this. He who plants a sapling cannot but water it; if he had no will to water it, he would not have planted it at all. This is the identifying principle of the jiva and the atman, the individual and the universal, man and god. You had written and published that the name of Swami is dancing and the form of Swami is being adored in home after home. And by this little vision, you were filled with ananda. But know now, that the name of Sai will arouse ecstatic delight filling the entire world, nay, every inch of it. People now sing 'All is Sai-full, this world is Baba-full.' This fullness will be realised, without doubt. Be bold; be in bliss; take up the burden of the duties assigned to you. Seek realisation through the four stages leading man to God - Dharma, Artha, Kama and Moksha." "When you resolve to progress on these lines, the Lord of Parthi will Himself be available to you to lift you and liberate you. Therefore, bangaroo, seek and gain your own motivating principle. I will never give you up. I will not forget you, no, never." "You have been maligning the rich; give up this erroneous habit. Not only the rich but you should not dishonor any one in any way. If they are bloated in their ego, they will suffer. How can it affect you? Remember, Sai resides in all; so maligning another means maligning Sai Himself." "Convey my blessings to your wife and children. I have written this long letter out of the compassion and love that I bear towards you. Be ever in joy; be ever intent on practice and experience. The Resident of your heart, Sai." Bhagavân conveys a world of meaning, an ocean of grace or a Gîtâ of wisdom, even through a short telegram. When Walter Cowan, whom He had revived from death, passed away at last, nineteen months after his 'coming back', Baba's telegram to his wife, Elsie, from Prasanthi Nilayam declared, "Walter arrived here in good shape"! Dwell on that sentence for a while. Walter had uttered, "Baba! Baba!" just before he passed away, for he was filled with years of grateful devotion. And soon after, Baba announced that Walter's soul had arrived. Similarly, when Narayana Bhat of Alike was killed in a motor accident, Baba had sent a message to his mother which read, "Narayana Bhat has merged in Me." Baba's words are known to cure not only every type of disease or ailment, but also to effect a miraculous change of attitude towards truth in the most incorrigible persons. "Some of the northern districts of this state - Bhind, Morena, Gwalior, Shivpuri and Datia - and some adjoining districts of Rajasthan and Uttar Pradesh, were infested with dacoits since the dawn of India's independence. The governments of Madhya Pradesh, Uttar Pradesh and Rajasthan tried their utmost to decimate them, but in vain. The dacoits were virtually in control of these districts. In 1960, Acharya Vinobha Bhave toured this region in order to persuade the dacoits to give up their life of crime. He was able to persuade a few of them to surrender. In October 1971, Madho Singh, who was the leader of the most prominent gang, approached Sri Jaya Prakash Narain to persuade him to take up the unfinished work of Acharya Vinobha Bhave. With the help of the Sarvodaya workers, J.P. contacted various gangs of dacoits. Ultimately his efforts bore fruit and about four hundred dacoits agreed to surrender. "One problem that was agitating the minds of the dacoits as well as the sarvodays leaders, was whether the dacoits should make an open confession of their crimes. Some sarvodaya leaders advised the dacoits to contest the criminal cases started against them in court. The dacoits were also of the same view." 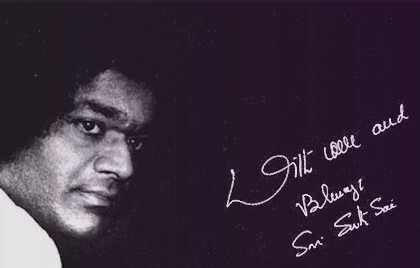 "On 23rd August 1972, Srimati Prabhavati asked Sri Hem Dev Sharma, secretary of the shanti mission in Gwalior, to bring a copy of the Hindi translation of Part II of 'Sathyam Sivam Sundaram', written by professor Kasturi. Sri Hem Dev Sharma's neighbor was a devotee of Baba, so he was able to procure the book from her. On that day, J.P. addressed the dacoits and read out the story of Kalpagiri as narrated in chapter six ['with wounded wings'] of this book. Bhagavân's advice to Kalpagiri, who had committed heinous murders and who was roaming about disguised as a sannyasi, to go to the police to make a clean-breast confession and undergo cheerfully the punishment he may be awarded, was listened to by the hard-boiled dacoits. It touched their hearts deeply, and convinced them that their real salvation lay not in refuting their misdeeds or trying to secure acquittals from law courts but in confessing them humbly in a spirit of repentance."